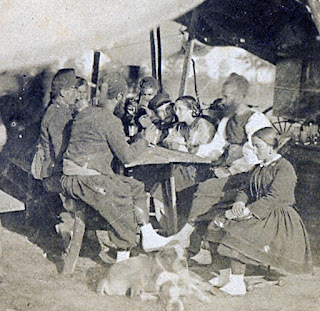 How well-fed were Allied soldiers in the Crimea? Stories abound of British soldiers subsiting on coffee, salt pork and biscuit, resulting in a high rate of mortality and sickness (usually bowel complaints and scorbutic fever) whilst their French counterparts were "fit and healthy." But were they? The average sedantary male requires 2,000 calories per day, whilst a male who exercises vigorously for 60minutes per day requires 2,500 calories. Modern British army 24-hour ration packs, used by soldiers on active service, have 4,000 calories. Late 19th century studies suggested a figure of around 4,000 calories for an active manual labourer, as shown in the following table.Yet, despite this, most soldiers received approximately half the calorific input required. Protein. Fat. Carbohydrate Calories Author. This ration provided: Protein, 154g; Fat, 31g; Carbohydrate, 457g. Total calories 2,793; and for a man of 11 stone gives 40 calories and 2.2 grammes of protein per kilogramme. This ration was much lower in caloric value than the 4,000 calories for men undergoing severe exertion, and was especially deficient in lipids. Protein, 129g; Fat, 69g; Carbohydrate, 440g; Calories, 2,956. For a man of 10 stone this is 46 calories and 2 grammes of protein per kilogramme. For a man of 11 stone the figures are 42 and 1.8 respectively. Crucially, the French rations had vegetables in them (British soldiers were meant to provide vegetables out of their own pay) which would have lowered the presence of diseases such as scurvy, but this is not borne out from contemporary literature, especially during the winter 1855-1856 when scurvy was the biggest killer of French soldiers due to a complete absence of vegetables in the diety. The following ration was that used by French soldiers in the trenches during the siege of Paris (1870-71) and was, presumably, very similar to that of French soldiers on active service in the Crimea, rather than the "text book" theory (above). Bread, 250grams. ; meat, 180grams. ; rice, 77 grams. ; biscuit, 250 grams. ; lard, 21g. ; coffee, 56 grams; sugar, 42g. ; wine and brandy equivalent to 100 grams. of carbohydrate. Protein, 83; fat, 32; carbo-hydrate, 457; calories, 2,510; and gives for a man of 10 stone 40 calories and 1.5 grammes of protein per kilogramme. This diet, owing to the scarcity of food, was lower in protein and fat than advisable for men undergoing hard exercise. The theoretical rations of French and British soldiers were similar in their calorific content (British 2,793; French 2,956) the British having a higher proportion of carbohydrate and protein compared to the French. French campaign ration, however, was predominantly carbohydrate, from bread, biscuit and alcohol. Whilst this would have prevent soldiers from feeling hungry, it failed to meet protein requirements and a lack of vegetables would have promoted scurvy and lowered immune systems. Also important in understanding the nutritional status of a soldier is when they ate. The British army traditionally ate twice a day: Breakfast was around 10am and Dinner around 12-noon; the former was usuaully bread and coffee whislt the latter was boiled beef or mutton served with boiled potatoes or boiled cabbage. Thus, in barracks, British soldiers were eating one large meal per day. On campaign Breakfast was usually around 7am, but from most letters British soldiers ate once per day after they had finished their duties, either in the trenches, on picket, defaulters etc. French soldiers also traditinally ate twice a day - Breakfast at 10am was usually some form of broth or vegetable soup with bread coffee and/or brandy whilster Dinner was served around 5pm and was a meat soup which might have been thickened with flour to make a beef stew. A report commissioned by Napoleon III , from 1849 - 1851, drew the same conlcusion as that commissioned by Marechal Soult ten years before: a soldiers' diet was monotonous and unhealthy and the "monotonous soup" was the prime reason why conscripts failed to re-enlist after their initial five-year conscription was "up". Furthermore, many young conscripts often starved or were severely malnourished due to the unexpected meal times and poor quality of the food. do you have any information on the image you used? thank you. What an excellent blog! Always nice to find a fellow Crimean War buff on the web. Hope you'll post more in the future. Can you give me the reference of your source? I am writing a term paper on this topic. It is pretty urgent since its due on saturday. I would definitely be grateful if you can.